They don’t want you to know the truth! This entry was written by whyevolutionistrue and posted on September 19, 2018 at 8:30 am and filed under Jesus and Mo. Bookmark the permalink. Follow any comments here with the RSS feed for this post. Both comments and trackbacks are currently closed. My sentiments for conspiracy theories have been hurt. If only WordPress could help me. And Pakistan. Together. Like BFF. Excellent edition of the strip. Let the guy use religion as a protection racket next. 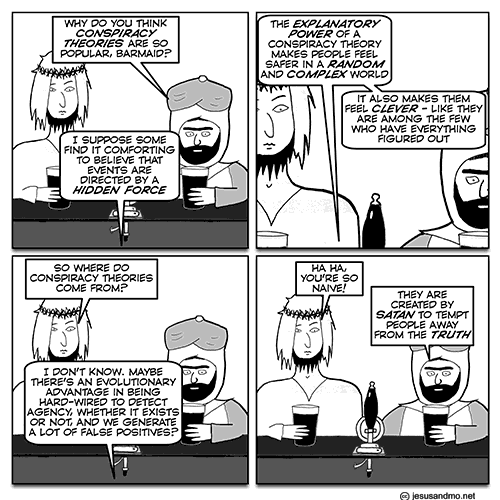 Isn’t religion the original conspiracy theory? Yes indeed. Some, no make that all, religions are conspiracy poly-pan penultimate pseudo-theories. On the veldt of our ancestry, those who misperceived a rustle in the grass as a lion lived to tell a self-deprecating tale around the campfire; those who misperceived a lion as a rustle in the grass, did not. I love a just so story in the morning. Smells like victory. Hasn’t all of evolutionary psychology (or Sociobiology or whatever it is they’re calling it these days) been described as a just-so story? I was just poking you, Ken. Just-so stories get derided a lot but one always has to remind oneself that sometimes they’re correct. Personally, as a scientist, I see no problem with them so long as it is acknowledged that they are evidence-free. But they are not necessarily unsupported ideas and can be some of the best hypothesis generating methods of doing science. I knew you were joking, and I laughed at the Apocalypse allusion, too. Satan is such a tempter! Fossils, geology, evolution, astronomy, physics…a busy tempter, that Satan is. Yeah, evil Satan, so wicked and devious, he has to work in ways utterly indistinguishable from purely natural phenomena. And yet he gives out so many presents at Christmas!